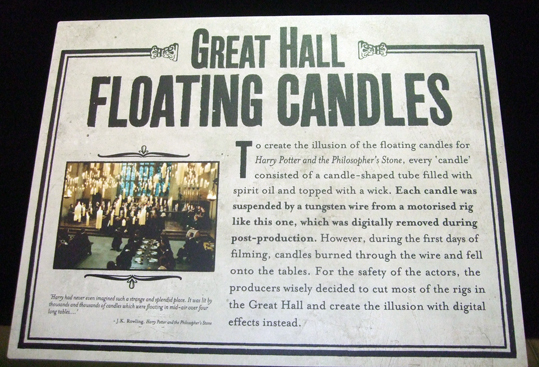 When Harry Potter first arrived at the fictional wizard’s school of Hogwarts and entered the great hall,“it was lit by thousands and thousands of candles which were floating in mid-air over four long tables, where the rest of the students were sitting.” So the description by JK Rowling in her famous first novel goes. Candles create a kind of liminal atmosphere, a flickering half-light in which all things are possible – the best kind of light for magic to work. Witchcraft, as far as I am concerned, should always be done by candlelight. While I would prefer real candles when I’m doing candle magic, sometimes it isn’t safe to use them and if you are having a Halloween party where real flames could be a hazard, what better than to create some fake ones similar to those in the wizard school in the movies? 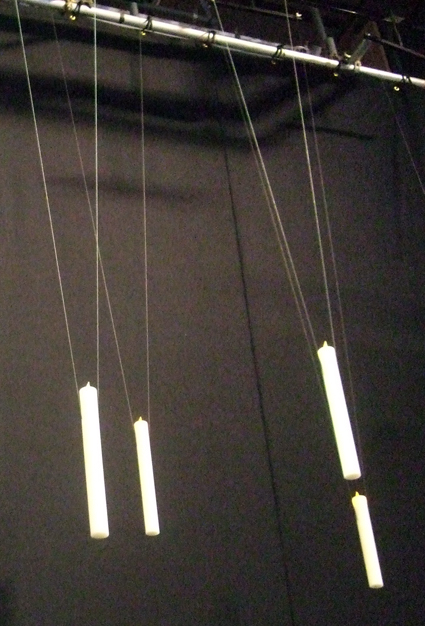 I learnt at the Warner Brothers Harry Potter studio tour that for the films, to create the illusion of floating candles, tubes were filled with spirit oil and wicks put on top, then these were suspended by wire. You can see a photo that I took of them at the top of this page and the description from the tour to the left. Apparently these weren’t particularly safe either as they kept falling down, so later on they simply added the floating candles digitally. 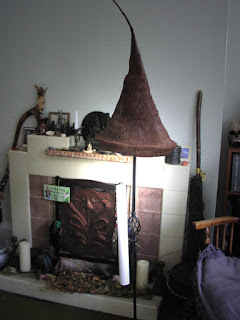 However, here’s how to make some really safe Hogwarts style floating candles like the one you can see above right, which I photographed hanging in my witchy room from a stand holding an old hat. You need the cardboard tubes, fake LED tea lights, cocktail sticks, flat cardboard, glue and paint. 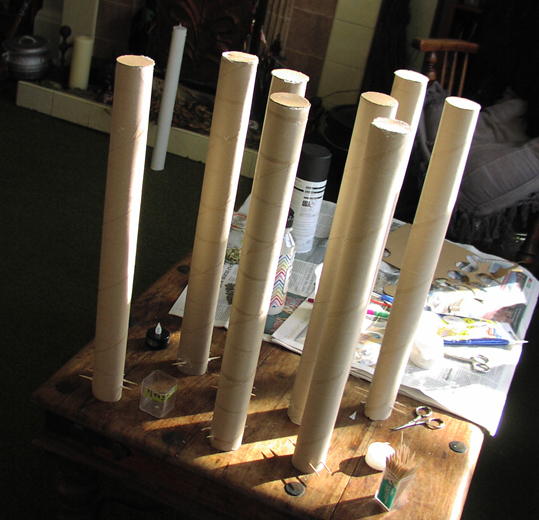 I used extra long cardboard tubes from inside rolls of paper used to go on top of therapy couches – kindly donated to me by a friend – but regular kitchen roll tubes are fine. Cut out cardboard circles the same size as the end of your tubes then glue these to the bottom. At the top of the tubes, poke two cocktail sticks right through both sides of the cardboard at the level you want your LED tea lights to sit inside, so that the artificial flame just shows over the top. Glue these in place on the inside, then trim them flat with the outside of the cardboard tube when the glue has dried. Paint the outside of your imitation candle in whatever colour you like. The ones in the movie are white, but you could also make some black ones for a Halloween party like the one in the photo below and to the right. When the overall coating of paint has dried, drizzle some thick paint down from the top to look like dripping candle wax. 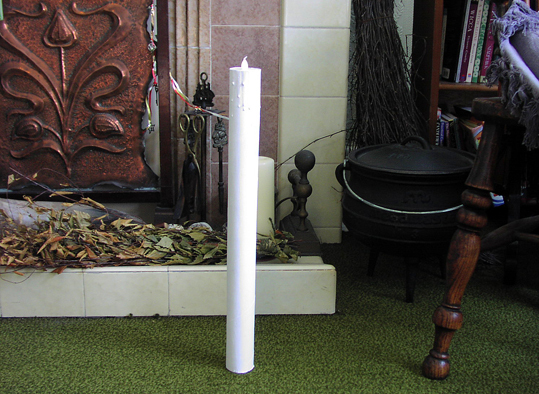 If you prefer to stand the cardboard tube candles up, like the one I photographed at the bottom or the black one to the left, then I recommend putting small pebbles or some dried rice or seeds inside the tubes to weight them down. I used pumpkin seeds - it seemed particularly seasonal. If you want to find out more about real candle magic, I have written a book called Pagan Portals - Candle Magic, published by Moon Books. 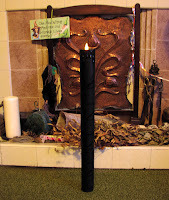 You can view Pagan Portals - Candle Magic on Amazon.